new licenses for interested retailers. Finally, create a competitive market-based wholesale distribution system for delivery and purchase of products by retailers. 2. Change/Extend SNAP Distribution Schedule: PFMA supports Senate Bill 235, sponsored by state Sen. David Argall and state Sen. Pat Stefano, which would adjust the SNAP distribution schedule to allow for a longer distribution period during which recipients would receive their monthly benefits. A companion bill was introduced in the House as House Bill 299 sponsored by state Rep. Tarah Toohil Currently, recipients receive their benefits in the first ten days of the month. 3. Vape/E-cigarette Formula Change: PFMA supports legislation to establish a five cent per fluid millimeter tax on consumable vapor products. This is a change from the current 40% tax on these products. PFMA supported SB 508, sponsored by Senator Bartolotta, and HB 1477, sponsored by Representative Wheeland, which would eliminate the 40% wholesale tax and replace it with a 5-cents per milliliter retail tax on e-liquid. We will support efforts this session aimed at achieving the same goal. sweetened beverage tax. The legislation would also preempt all municipalities from trying to enact a similar tax or fee. Legislation will again be introduced this session to address the issue. 5. Price Gouging/Emergency Declaration Reform Legislation: PFMA supports Senate Bill 139, sponsored by state Sen. Judy Ward, which would update the Price Gouging Act and emergency declaration process to benefit consumers and businesses alike. reimbursement for facility buildouts. Also, PFMA would support an increase in the profit rate that truck stops/retailers can secure from their gaming operations. 7. Regulatory Reform: PFMA supports efforts to reform and streamline the regulatory landscape on the state level. This includes rescinding any harmful regulations that are currently in place and preventing new and harmful regulations from being enacted. 1. Increasing the State Cigarette Tax or Instituting New/Additional Taxes on OTP or E-Cigarettes: PFMA opposes any proposed increases to the state cigarette tax as well as the implementation of new taxes on e-cigarettes and other tobacco products. These taxes were increased in 2016. 2. 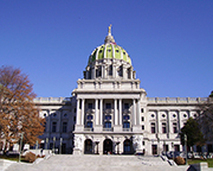 State Sales Tax Rate Increase and Base Expansion: PFMA opposes any attempt to raise the state sales tax from 6% or expand the base to additional products. 3. New Government-Mandated Statewide Paid/Unpaid Leave: PFMA opposes any statewide paid or unpaid leave law. PFMA supported SB 128 (Eichelberger) and HB 861 (Grove) last session which would prohibit municipalities from passing such mandatory leave ordinances. We will support similar efforts this session as legislation is introduced. 4. Property Tax Elimination/Tax Shift: PFMA opposes the elimination of property taxes which would require a dramatic increase in the personal income tax and sales tax. 5. Personal Income Tax Increase: PFMA opposes an increase in the personal income tax on its members and their customers.